Once you go bald, it’s hard to go back. Shaving your head comes with so many incredible perks: you save on things like shampoo and grooming products, styling your hair has never been easier, and you can rock a new, scene-stealing look. Maintaining your shaved head, however, isn’t as simple as most people think it is. You can’t keep going back to the barber’s, that is unless you want to say goodbye to your bank account. Many men choose to go the practical route instead and DIY it with their own personal head shaver. The biggest mistake you can make is thinking that any old razor will do. Standard razors can be clumsy, inconsistent, and even a little dangerous, but an electric shaver can turn your dreaded morning shave into an effortless, fun routine. Head electric shavers definitely win out on convenience and speed, but some come out ahead of the pack. Step up your shave game with one of these top 10 best shavers for bald heads. 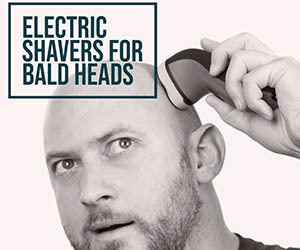 Let’s go a little more in-depth into what makes these electric head shavers the best. We spent countless hours researching and reviewing different brands and models to give you this ultimate guide to the best electric shavers for bald heads. This DIY haircut kit is pretty much everything you need to give yourself the shave you want, all for a mind-bogglingly affordable price. Remington is one of the biggest names in the personal care business, so it’s no surprise that one of their electric shavers makes this list. The Remington HC4250 is, quite literally, the complete package. Not only do you get one of the best head shavers on the market, but you also get a cleaning kit, 9 combs, and a travel pouch. The kit comes with several different plastic clip-on attachments to achieve your desired length. Ranging from 1/16th of an inch to 5/8th of an inch, you can get a super-close shave or buzz cut pretty easily. The HC4250 also features stainless steel blades that are perfect for clipping head hair, facial hair, and even body hair. One of the reasons this was included in our list of best electric shavers for bald heads is because of the extra-wide blade. Because the blade is much bigger than most other shavers, you can get more shaving done in less time. The ergonomic design and rubberized grip are a perfect introduction for beginners into the world of at-home haircuts. However, there are a couple things that keep this shaver from being flawless. The combs are made out of plastic that is prone to bending and breaking, and some users had clips that didn’t attach properly to the shaver. Also, the 40-minute cordless running time isn’t absolutely terrible, but it’s far from what we know electric shavers are capable of. Skull Shaver’s newest line of electric shavers was specifically designed with the modern man in mind. This unique head shaver is small yet super powerful. We absolutely loved the Bald Eagle Shaver when it first came out, but its main downfall was that it wasn’t waterproof. Thankfully, Skull Shaver listened when they come out with the Pitbull, the third generation of their game-changing shaver. In the fight of Skull Shaver Pitbull vs. Bald Eagle, we’re glad to say that the Pitbull wins out in every respect. The manufacturer completely rebuilt their product, keeping the things that made the Bald Eagle great while improving on its weaknesses. Now completely waterproof (and therefore usable for both wet and dry shaving), the Pitbull Gold also boasts a 20% boost in blade power and a 10% boost in cutting range. The Pitbull comes in 3 “versions”—Silver, Gold, and Platinum. They’re pretty much the exact same 5 rotary blade shaver, except with different cordless operation times and warranty periods. We feel that the Gold is the best value of the three, with a 90-minute cordless operation (same as the Platinum version) and an 18-month warranty. While the Pitbull is marketed as a dual head and face shaver, we found that while it performed excellently shaving heads, it wasn’t as good when used to shave or groom facial hair. There also seems to be some issues with reliability, as some customers complained that their Pitbulls didn’t work consistently even when charged. Arguably the best foil bald head shaver for men, this Panasonic Electric Shaver and Trimmer gets a close and comfortable shave thanks to its commitment to simple yet effective technology. No frills, no fuss—just a damn good shaver. That’s how we’d describe the Panasonic ES-LV95-S. At first glance, it doesn’t look wildly different from its competitors, but it’s deceptively simple exterior hides a powerful and innovative design. The biggest draw of the ES-LV95-S is its multi-pivot, 5 Nanotech blade rotary head. The blades move to adapt to the contours of your head which ups its shaving capabilities. Coupled with the Shave Sensor that automatically adjusts its power level to handle different hair lengths and thicknesses, this is probably the smartest shaver of the bunch. Panasonic made sure that this product was brilliant in every aspect of its design. The one-touch cleaning and charging system is a godsend for any guy who sometimes gets a little lazy to clean up after a shave. It also makes for a great travel shaver, thanks to its universal voltage, travel lock feature, and included travel pouch. 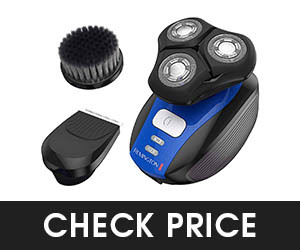 It’s not insignificantly more expensive than other shavers, especially if you include the automatic cleaning & charge station, but we feel that the price tag is justified. We find that its 40-minute cordless battery life is a little bit lacking, but it only takes an hour to get it up to full charge. 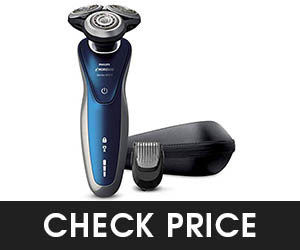 The Philips Norelco 8900 shows up on a lot of “best electric shavers” list for good reason. Its fast, easy to use, and delivers excellent results. In the highly competitive electric shaver industry, one name stands above the rest. Philips Norelco has been making excellent shavers for almost a century, so you can trust that they know their stuff. The 8900 stays true to their reputation as one of the best-performing head shavers even right out of the box. The Norelco 8900 is actually a rebranded Sensotouch 3D shaver. It uses the same 3 rotating UltraGlide blades. Unlike other rotary shavers, the blades on the 8900 actually move independently of each other in eight different directions which means that you can get a much more precise shave without damaging or irritating your skin. And if you thought it couldn’t get better, the 8900 can also come with an automatic cleaning station with a dual filtration system that cleans, lubricates, and charges your shaver all in one go. It also comes packaged with an attachable beard styler, doubling it as a great face shaver as well. If we had to nitpick, we’d say that there are really only two downsides to the Philip Norelco 8900. One is that the 50-minute cordless run time is decent but not exceptional. The other is that the blades will need regular replacing to maintain the same shave quality, but that can be said about many other different shavers as well. The price tag is tempting on its own, and even moreso when you take into consideration all the extra attachments! The second Remington to make it on this list, the Verso is another great contender for the top head shaver title. Like the Shortcut Pro, the Remington XR1400 head shaver is a compact, hand-held device that offers you maximum control and portability. It’s also a 4-in-1 device that offers quality shaving, trimming, detailing, and scrubbing. The 3 rotary blades combined with the HyperFlex neck helps the XR1400 adjust to your face or head’s shape. 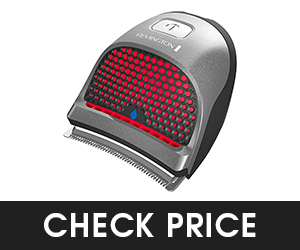 The PrecisionPlus head is able to shave both short stubble and long hairs with ease. It’s also encased in a waterproof shell that allows for wet/dry shaving and super quick clean-up. What really sets the Verso apart is the extra attachments. Now we know that its main job is to give you a precise shave, but we can’t help but give kudos for the additional functionalities. The included exfoliating scrub brush cleans away dirt, oil, and other debris while the beard trimmer has an impressive 10 adjustable lengths. This means you can trim your beard after you’ve finished shaving your head. The 45 minutes of cordless power leaves a little to be desired, but it should be enough for at least 1-3 uses, depending on how much you have shave off. It’s also not powerful enough to give a completely clean cut. The plastic attachments seem a little bit too fragile for this shaver and are prone to breaking as well. If you want a barbershop-level trim and shave, then look no further than the Wahl Professional 5-Star Finale Shaver. This bad boy is a favorite of haircutters and stylists, and it could be your next fave too! Wahl threwback to the good old days with this modern twist on a gorgeously retro design. It’s a marriage of both fashion and function—a good-looking shave and a good-looking shaver, rolled into one compact package. You can expect nothing less than the best from the inventor of the first hand-held clipper. 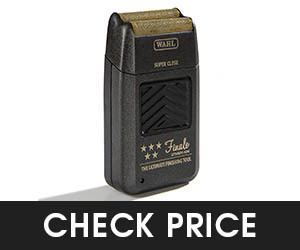 The 5-Star Finale is part of Wahl’s commercial line of shavers, so you already know you’ll get a professional-grade shave. It’s versatile enough that you can get a variety of styles and cuts out of it, including a clean-cut bald head. It works just as well on the hair on the neck or face. The gold foil really gives it a premium feel, and it looks way more expensive than it actually is. The foil is both hypoallergenic and really thin, to give a close shave while minimizing irritation and damage to your skin. We believe that it actually gives the closest shave out of all of the shavers on this list, approaching the precision of a traditional razor. As much as we’d love to give it a higher rating, there are some things that we just can’t overlook. The foil can be too thin, which means that you’re more at risk of nicking or cutting yourself accidentally. It’s also prone to tearing or breaking if too much pressure is applied. We also have to dock points for what seems to be a shipping issue: some people purchased brand new Finale’s but received used/refurbished/damaged ones instead. The swivel head is an incredibly useful feature that you can’t find anywhere else. If you hate those hard-to-reach spots, this one can lend you a helping hand. This isn’t the first time we’ve mentioned Philips Norelco (nor will it be the last). The QC5580 is a beast unlike any other, so we feel like it deserved a mention. The biggest difference between the Philips Norelco QC5580 and the rest of the pack is its rotating head. The blades move 180 degrees so that it’s much easier to reach the spots you normally can’t. You can choose from 14 different lengths ranging from 0” (or a total bald head) to ⅝”. The stainless steel blades are completely self-sharpening which means even less work for you. We especially love the little things that make this a convenient shaver to use. The battery life clocks in at around 60 minutes of cordless use, which is enough to get a couple good shaves in before it needs recharging. There’s also a battery life indicator on the device itself that notifies you when it’s running out, so you never have to worry about it dying mid-shave. As the cherry on top of the cake, Philips offers a 2-year warranty in case of defective or malfunctioning parts. You might get some use out of that warranty after all. If the reviews are anything to go by, a lot of customers complained that the plastic parts easily break off or bend. Buying new parts can be pricey, so check the warranty to see if it covers you. 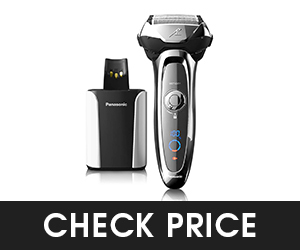 The right combination of performance and price, the Panasonic ES-RT97-S beats out other well-known brands with this smooth shave. If you can’t afford the ES-LV95-S Arc5, this is a great budget-friendly alternative. Panasonic really hit the jackpot when they came up with the Arc3 version of the ES-RT97-S. At a fraction of the cost of their more high-end models, you can still get incredibly quick and clean cuts. This foil shaver has 3 stainless steel blades for great precision and speed. It’s also hypoallergenic which means that it can get up close and personal without being irritating. The 2-color LCD battery indicator lets you know when your shaver needs to be recharged which could be anywhere from once to a few times a week, depending on your usage. Charging is easy, though, with the automatic clean & charge station that comes with the shaver. We appreciate the 45-degree pop-up trimmer that makes shaving smaller areas much, much easier. We also love that it’s completely waterproof, allowing for easy clean up in mere seconds…almost as convenient as the self-cleaning station. There’s not many negative things we can say about the ES-RT97-S. A small minority of users claimed that even multiple passes could not get the close shave they wanted, but that doesn’t seem to be the case for the majority. 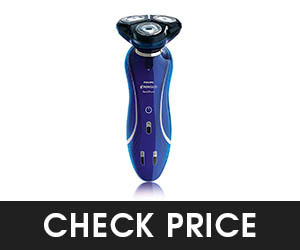 The Philips Norelco 6100 is a great first shaver for any man trying it out for the first time. It hits the sweet spot of affordability and precision. Also known as the Sensotouch 2D or the Philips Norelco 1150X, this Series 6000 shaver solidifies Philips Norelco as the big kahuna of men’s grooming. This third entry is a more entry-level shaver meant for our more beginner readers who want an unintimidating introduction to the world of electric shaving. This wet & dry shaver uses Philips’ proprietary Gyroflex 2D technology that quickly and easily adapts to the contours of your head. Each of the two precision heads had 9 angled cutting blades that cause little friction and irritation while getting a good shave. We like that the 6100 has a lightweight, non-bulky handle and dual voltage capabilities, making it good for both at-home and on-the-go shaving. While the 40-minute shaving time is just average, we have to commend the quick charge feature that gets you a single shave’s worth of power in just a few minutes. What we don’t like is the overall aesthetics of the shaver. While taste is subjective, we feel that the bright blue glossy plastic makes the shaver look and feel cheap. Also, unlike the more premium Philips devices, the heads on this one do not tilt individually. Still, it’s much better than a non-pivoting shaver. Can you find anything that’s more original than this? The ATX Razor boasts a bold look and performance that outshines almost everyone else on the list. We know it’s cheating a little bit to include a standard/non-electric razor, but we couldn’t write a best head shaver list without mentioning the HeadBlade ATX Razor. It may look almost toy-like at first, but don’t be fooled. 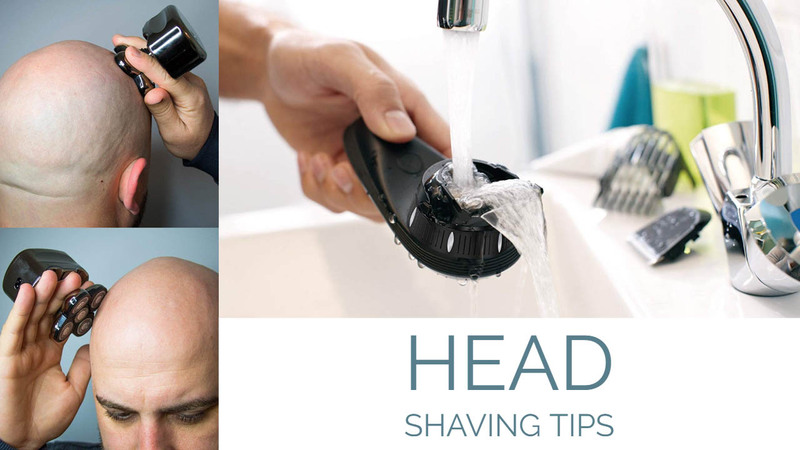 You won’t find a more efficient and precise head shave! Because it’s a traditional razor combined with a smart design, there’s actually a very low learning curve. It’s also incredibly versatile and can be used on any part of your body, not just your head. The wheels are more than just decor, they help the blades easily glide over the skin without causing bumps, nicks, cuts, or rashes. While we did spend countless hours researching and reviewing every single one of the electric shavers on this list, hair care is an extremely subjective and personal thing. Our goal isn’t to tell you what we like, it’s to help you find an electric shaver that you like! That’s why we included this handy little buyer’s guide—so that you can choose the right tools to get the job done just the way you want it. We’ve talked about this at length before, but basically, different people have different reasons for going completely bald. Some do it to hide their receding hairline or thinning hair. Others do it because they hate the hassle of taking care of their long locks. Still, others simply prefer it that way. No matter your motivation for shaving it all off, the best head shaver is an absolute must-have in your grooming arsenal. In the sea of hair clippers, razors, trimmers, and dozens of other tools, what makes an electric shaver stand out for bald heads? Here are some of the biggest advantages that electric shavers have over other kinds of shaving equipment. There’s no doubt that electric shavers are truly the kings of convenience. The best ones are designed to do most of the work for you. Many are compatible for both wet and dry shaving methods, so that you can get the exact shave that you want. You can also keep a close shave even if you’re traveling since most models have cordless capabilities. Tired of razor burn, in-grown hairs, and accidentally cutting yourself every 5 seconds? With an electric shaver, that’s all going to be in the past. Electric shavers are considerably less dangerous than traditional razors and are less likely to nick, cut, or irritate your skin. Shaving can seem like a lot of work, especially if you don’t want to get up early in the morning just to maintain your shaved head. Thankfully, you don’t have to! Electric shavers can get the job done in just a matter of minutes, which means more time sleeping in, spending time with the people you love, and virtually anything else you could do with those extra 30-45 minutes a day. Fancy gadgets, creams, and other shaving accessories can clutter up your bathroom counter. Using an electric shaver can potentially help you save space (and money) with a versatile, all-in-one product. Many electric shavers can be used in both wet and dry situations, with or without foams, gels, or creams. Some can even be used for your face, neck, and other body parts! With the proper use and maintenance, a high-quality electric shaver can last you for years. Compare that to a traditional razor which could need replacing in just a matter of months. Electric shavers are built to be tough yet sleek...just like you. This isn’t the kind of decision that you can make on the fly and simply hope for the best. An electric shaver is an investment, so you need to do your research before you drop a few hundred dollars on one. 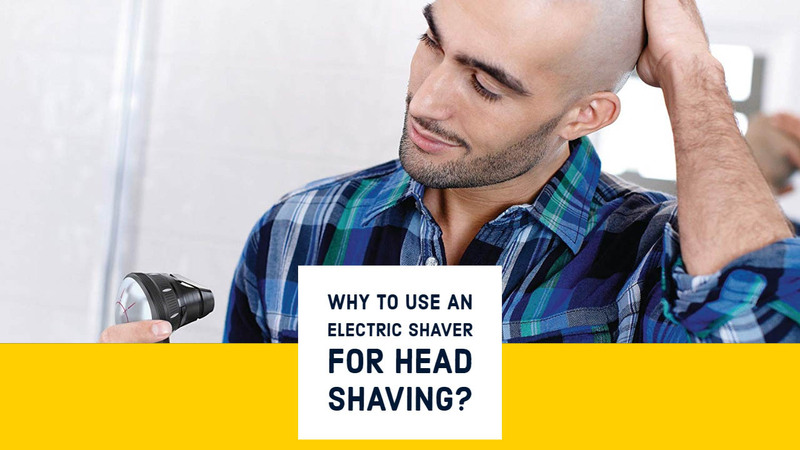 Below are some of the things you need to look out for when choosing an electric shaver for head. While there are certainly exceptions, 99% of electric shavers fall into one of two categories: foil or rotary. If you have sensitive skin, shorter or thinner hair, or are more concerned with minimizing damage to your scalp, we suggest going with a foil shaver. These types of shavers cover the blade with a thin piece of foil which protects your head while efficiently cutting hair. 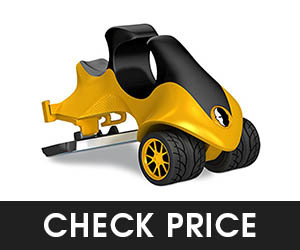 Rotary shavers usually have 3 or more blades that move in a circular motion. 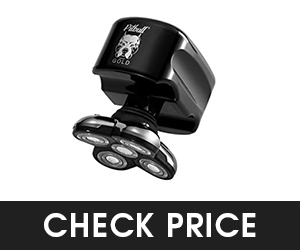 This makes it easier to get a closer shave, even if you have longer or thicker locks. Using a shoddily-constructed electric shaver is almost as bad as not using one at all. Worst case scenario is that your electric shaver is difficult to use, easily damaged, inconsistent, or even dangerous. Go for electric shavers that are made of durable materials and with a solid design that will last you for a long time. You would also need a shaver that has the features that you particularly need, like LED/LCD interfaces to remove the guesswork, dual wet and dry shaving modes, or a waterproof shell and rubberized grip if you plan on shaving in the shower. 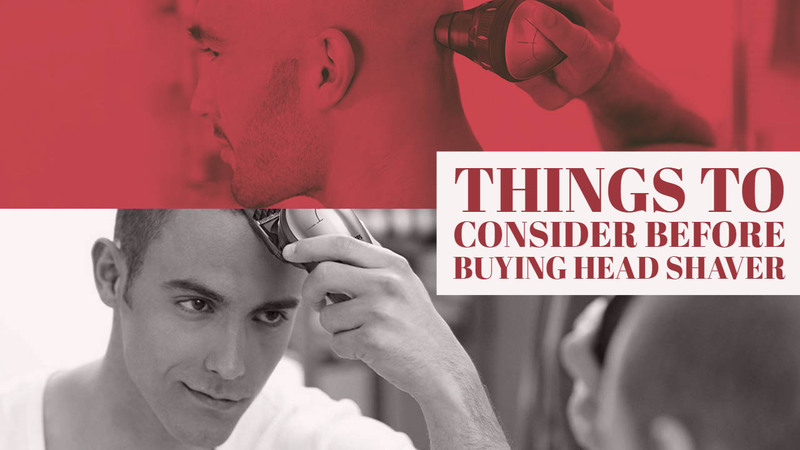 There is no one-size-fits-all solution to head shaving, which is why manufacturers make different kinds of electric head shavers to cater to different kinds of men. If you’re always on the go, make sure to spring for a portable cordless electric shaver that you can easily bring with you on your trips. Battery life, weight, and necessary accessories would most likely be the biggest deal-breakers for you. On the other hand, if you’re more of a laid-back kind of guy that doesn’t want to deal with the mess and stress that comes with regular head shaving, you could get an electric shaver that fits your lifestyle. There are shavers that come with a cleaning and charging station that automatically takes care of the hard stuff for you. All electric shavers need a little TLC once in a while, but some are much more high maintenance than others. Take into consideration how much time, money, and attention you can reasonably give to your electric shaver. Are you willing and able to clean it every day? How often do you have to replace the blades? Do you have to sharpen or oil the shaver regularly? If you have a busy schedule or just aren’t ready to take on the extra work, there’s no shame in buying a low maintenance shaver! This is a mix of the manufacturer’s overall reputation and the specific shaver’s reviews. The most well-known and trusted brands include Philips and Panasonic. These guys are usually reliable and have good after-sales support, so we generally recommend them to men starting out on their bald head journeys. However, there are also newer, independent brands that could be worth a second look. They might not have the name or fame that the mainstream companies do, but they are usually more innovative and unique. If you want to step up your game and try something new, then don’t be scared to veer away from the big brands. No matter which brand or shaver you go for, always read reviews! A bald head shaver might sound great on paper but could actually fall short in real life. Believe us when we say that it is possible to get the right balance between quality and price. 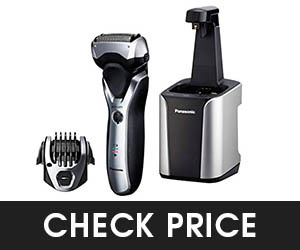 There are electric shavers at every price point, so we’re confident you’ll find one that fits right into your budget. Just remember: you get what you pay for. Now, that doesn’t mean that expensive is always better. Sometimes you could just be paying extra for unnecessary features or a brand name. But don’t trust a ridiculously cheap deal, either. Factor in future payments as well. 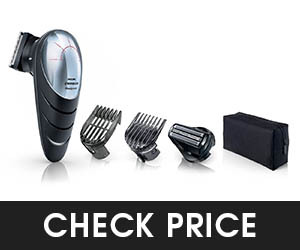 Shaver manufacturers usually offer warranties in case your shaver needs repair or replacing, which could significantly lower the shaver’s long-term cost. You’ll also need to consider how often you’ll need to replace parts such as blades, foams, gels, etc. There’s going to be a learning curve, and that’s okay. With a little patience and practice, you’ll be shaving your head like a pro in no time. Take a hot shower before shaving. This makes your hair much easier to cut. If you have long hair, you might need to clip your hair to a shorter length before you go full bald. This makes it easier for your shavers while protecting them from too much wear and tear. Clean the shaver regularly. If it doesn’t have a self-cleaning system, remove build-up and gunk after every use. Even if you’ve got your daily shave routine down, pop into the barber’s every once in a while. A professional shave every 4-6 weeks helps keep a clean, even cut. It’s normal for your scalp to feel dry, sensitive, or flaky after a shave. Get a good moisturizer to keep your bald head in tip-top shape. Always use sunblock to protect your head when you go out. This helps you maintain a healthy-looking scalp. We answered some of your most pertinent questions about electric head shavers. Can You Shave Your Head With An Electric Shaver? Yes, you definitely can! There are other tools you can use like clippers, razors, or trimmers. But electric shavers do have an advantage over other kinds of shaving equipment because of their speed and convenience. Can I Use The Same Shaver For My Face And Head? While some electric shavers can definitely pull double duty, some head shavers don’t perform as well as a face shaver and vice versa. This is mostly because your face is flat while your head is round (and you can’t see all the way to the back), which makes it a lot more difficult to shave. How Do I Clean My Head Shaver? Always check with the manufacturer about the recommended cleaning process for your electric shaver. Some models, like the Panasonic ES-RT97-S or Philip Norelco 8900, come with a self-cleaning system. Others are waterproof and can be cleaned out by running them under the tap. What’s the secret to a beautiful, healthy shaved head? The right tools. Getting the best electric shaver for a bald head isn’t going to be a walk in the park, but it’s worth the effort. If you’re trying to achieve a professional-grade shave at home, then you’ll need to invest in a good electric shaver. After rounding up some of the best shavers on the market, we noticed that one electric head shaver for bald heads stood above the rest. The Philips Norelco Electric Shaver 8900 is our 2019 top pick because of its incredible design, innovative technology, and consistent results. It hit the mark on so many levels that we can’t even fault it for the little cons it had. Of course, that doesn’t mean that the 8900 is perfect for you. We hope this round-up will guide you into choosing the electric shaver that works for your specific needs and lifestyle. Just do your research, consider different options, and be patient. One day, you’ll be one shave closer to sporting a healthy, beautiful bald head.